A rough start, but overall somewhat smooth on mostly damper-only. Settled in at 6, .003, 11. Kingsford charcoal with the basked 3/4 full. I used my extra lazy man method to light the coals. There's no meat probes because it's baby backs. This was my first cook using the HM since last spring. It magically stopped working and I couldn't figure out why. I tried building a new one so this one decided to work again. 1 degree Farenheit? Perfect Time for Smoking! It is really cold here, but that doesn't stop Heatermeter! 10 hours in and looking great. My first cook with the Heater Meter + MicroDamper! 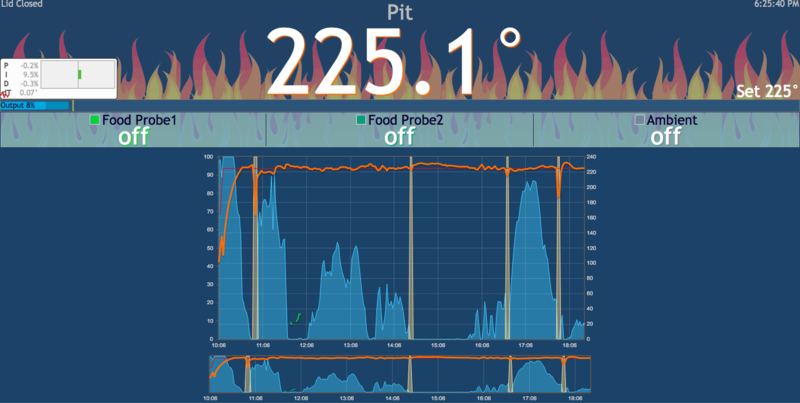 I have some tweaking to do on the PID values since the Pit temp struggled to get above my set temp. I suspect some of the issue was that the outside temp was around 10 deg F today. 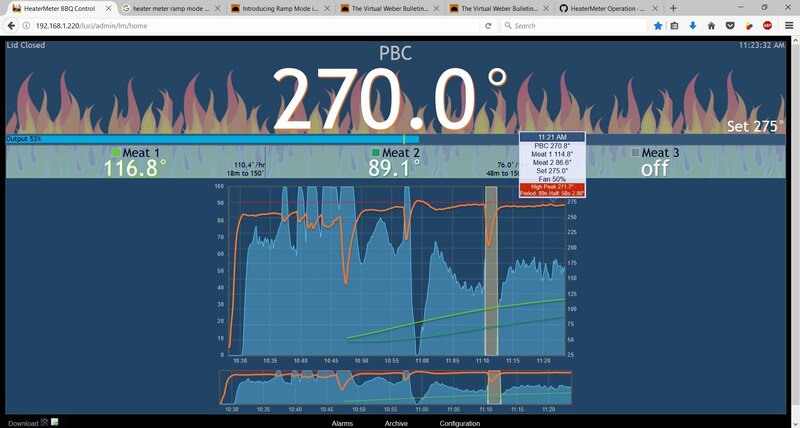 I also had a small hiccup where the web app was showing Pit Temp as "---" and appeared to be frozen. I cycled the HM power, everything came back up but it reset the graph. Not sure what happened there, might keep an eye on it and do some more research if it happens again. Last edited by BigMike; 01-07-2018 at 12:56 PM. I'm doing the first test burn on a Primo Oval lg. HM4.3 and Micro Damper. No food. Set point 200d. Been playing with the PID values and the best I seem to be able to do is keep the temp between 202d and 198d. Should I expect to be able to do better? If it's consistent and staying within a 4 degree range, no need to spend too much time tweaking things. I just finished up my heatermeter last week and ive done a couple meatless test cooks to get things somewhat dialed in. Yesterdays test cook started a little rocky at +/- 7 deg. It seems like if I have the bowl really full, the fan kicking in causes it to overshoot a good bit. I reduced the max fan to 30% to see if it would smooth it out and the last 12 hours was +/- 1 at the most, and most of the time was +/- 0.5 . I am pretty impressed so far. I didnt have the bowl in my vision classic b near full, and got 17.5 hours at 225. The previous test cook, though a bit more rocky, lasted 20 hours at 225 and i had the bowl about 75% full. The wife is out of town at a conference, and El Diablo (mothe rin law), has the kids tonight, so I just fired up another test cook, this time with real meat! though just some boring wings I was going to do some ribs but couldnt run away from work early enough to get them on in time for dinner. Last edited by MartinB; 01-31-2019 at 09:24 AM.